Home - Monexo Insights - Personal Loans in Chennai – Interest Rates as low as 12.98% p.a. Personal Loans in Chennai – Interest Rates as low as 12.98% p.a. - Personal loan for education help you pursue Executive Education. - Personal loan for debt repayment help you in consolidating your sundry debts into one single loan. - Personal loan for weddings and social celebrations help you in reducing the immediate financial burden. - Personal loan for health and medication helps you in getting healthy and productive again. - Personal loan for travel and shopping let you have a relaxing and happy holiday. But you can also utilise the funds from a personal loan to start your own small business or use it for hundreds of other expenses. So is it easy to get a Personal Loan in India? Well, it depends on the platform you use for applying for a personal loan. For example: If you apply for a personal loan in Chennai with a bank or non-banking financial company, you may have to go through a lengthy loan approval process and still have your personal loan application rejected. The reason for this is the multi-layered application, verification, approval and disbursement methods used by Indian banks and NBFCs. 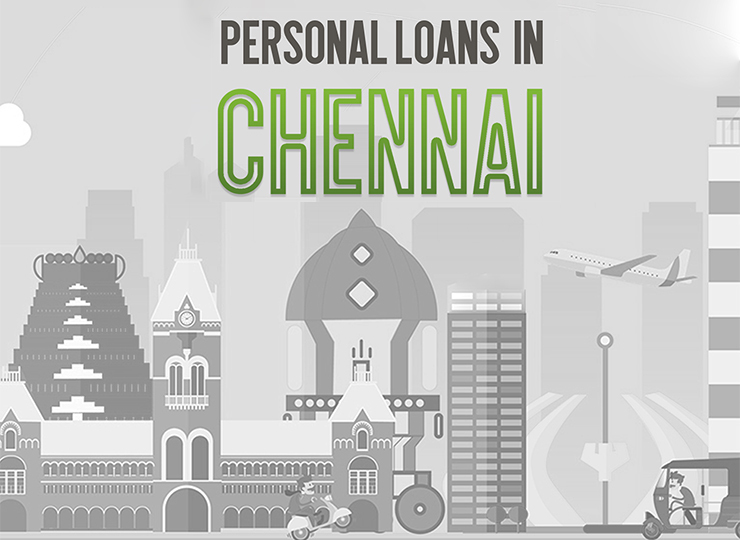 On the other hand, applying for a P2P personal loan in Chennai will get you faster loan approval and disbursement. What is a P2P Personal Loan? P2P is the short form of peer-to-peer lending. P2P loans are facilitated by online platforms where borrowers can connect with lenders who are looking to earn an interest on their capital. The advantage of a P2P loan is that you can negotiate your loan terms and get the lowest interest rate for personal loans. How are P2P Personal Loans faster than loans from banks and NBFCs? - Since you are connected directly with the lender there are no middle-men like loan application agents and agencies. So your application is submitted directly for lenders to review. - P2P Personal Loan application process is completely online so there are no lengthy forms to be filled and submitted at loan counters for manual verification. Online personal loan application also reduces the chances of filling wrong information. So, your loan application is processed much faster. - P2P Lenders and platforms are able to e-verify most of your financial information. So, approvals are given faster than an average bank loan. - Finally, since the transfer of funds is also online you don’t have to wait for your loan cheque or demand draft to be cleared for payments. Funds are transferred instantly to your bank account. How can P2P Platforms offer lower interest rates than banks and NBFCs? As mentioned above, P2P personal loans have a completely online process so various costs, such as form and file charges, processing fees, cost of verification, etc. borne by banks and NBFCs are negated. P2P Platforms then pass these cost benefits to borrowers in the form of lower interest rates. If all your documents and finances are in order, you can get a personal loan at interest rates as low as 12.98%. Do I need a high CIBIL score for getting a P2P Personal Loan? P2P platforms generally have their own credit scoring mechanism. So even if you have a low credit rating, your loan application can get approved. However, do note that P2P interest rates are based on the risk factor associated with a borrower’s account. So, you may have to agree for slightly higher interest rates if you have a low CIBIL score. How can I get a P2P Personal Loan in India? Monexo is the leading P2P lending platform in India. If you are looking for a personal loan in Chennai, simply visit the www.monexo.co/in to create a borrower account and start your loan application. Monexo offers online personal loans in Chennai and the application process only takes 5 minutes to complete. You need to give basic details and upload the required documents to submit your first online personal loan application. What is the eligibility criteria for getting a P2P Personal Loan with Monexo? Monexo has kept the personal loan eligibility and document to a bare minimum. So much so that almost every salaried person can get a personal loan online. Ready to apply for your first personal loan online? Start your loan application with Monexo, here.